You can download and install the FTDI drivers directly for your Windows 7, 8, or 10 computer with the button below. Your browser may pop up a window that says "You have chosen to open CDM V2.12.00 WHQL Certified.exe." "What would you like to do with this file?". Click "Save File". If the browser automatically downloads it, click "Open" when the download is complete. Once the file download has completed, a window will open that has the title "FTDI CDM Drivers". Click "Extract". You may receive an error: "The requested operation requires elevation". Click "OK". The process will continue. A new window will pop up that says "This program might not have run correctly". 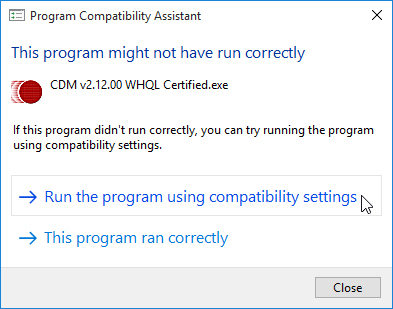 Click "Run the program using compatibility settings". A blinking icon may pop up in your task bar. Open that window. The next window that pops up will ask "Do you want to allow the following program to make changes to this computer?". Click "Yes". If your computer showed an error during your first attempt at installation, it may take you back to the first bullet. That's OK. Press "Extract" again and the installation should take place correctly this time. A device driver install wizard will guide you through the final steps. Click "Next", then agree to the license agreement, and click "Finish" to complete the installation. If your computer showed the error during installation, it may prompt you "Did this program work correctly?". Click "Yes". Great! Now you have completed the hard part of preparing to use Maker Board for the first time. Click the button to get back to downloading the example code files and uploading them to Maker Board.